edgeGEN™ – Powered by Cummins, is a Distributed Energy Resource (DER) that combines the reliability of Cummins generators with the enhanced economics of Tangent AMP™ a Distributed Energy Resource Management System (DERMS). 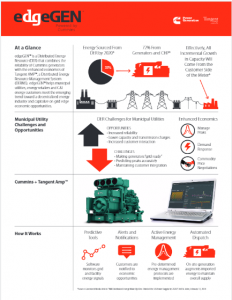 edgeGEN™ helps municipal utilities, energy retailers and C&I energy customers capitalize on grid edge economic opportunities. edgeGEN™ is a Distributed Energy Resource (DER) platform that enables energy retailers, municipal utilities and their large C&I Customers to achieve faster ROIs on Cummins generators by adding Tangent AMP™, a Distributed Energy Resource Management System (DERMS) that predicts and dispatches generation in response to high prices and other economic opportunities on the energy grid. What are DER and DERMS? 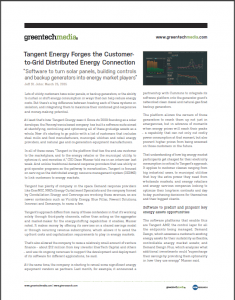 Tangent Energy™ DERMS software monitors grid, facility and generator signals to predict when grid economic conditions support generation dispatch. When conditions are right, Tangent Energy™ signals the generator to operate for a pre-determined period of time Tangent Energy™ then monetizes the result through the C&I customer’s energy retailer or municipal utility. C&I customers see higher savings in their energy bill, retailers and municipal utilities realize lower costs and Tangent and Cummins share a new revenue stream.